Watch him tweet out a call for requests before a live show and get trolled by David Crosby. Any requests? Real instruments? No problem. 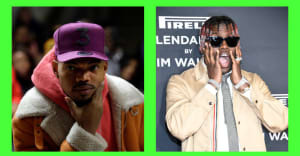 Chance The Rapper is one of the biggest artists on Twitter so it makes sense that they would recruit him to be the star of their new advertising campaign. In a new TV spot revealed today, June 19, Chance is shown preparing for a live show when he tweets his followers to ask if they have any requests for his set. The @ replies soon flood in and we see requests for specific songs, like "Same Drugs" and "No Problems," as well as "anything from Acid Rap." Bizarrely, David Crosby pokes fun at his many Twitter beefs by popping up to demand "any song with real instruments." You can check out the whole thing above, now.